Review Summary: The critically acclaimed "Without You I'm Nothing" is the bands second full length album. It is a single orientated album creating the platform of the bands commercial success outside Britain. After the almost impeccable release from the bands self-titled album with Nancy Boy rocketing to #4 on the U.K charts the band’s drummer Robert Schultzberg left the band mid- 1996 due to personal interests. Steve Hewitt, a past drummer of the band filled his position. They spent the end of 1996 and the majority of 1997 touring. Placebo was then invited to play at David Bowie’s 50th birthday leading to a guest appearance on “Without You I’m Nothing” which was released in October 1998. Following rising to commercial success throughout Britain it was time for Placebo to burst into relentless American music scene. The band offer a darker, more mature sound on their second album providing unforgettable singles but does disappoint with a poor performance by the other songs on the album. 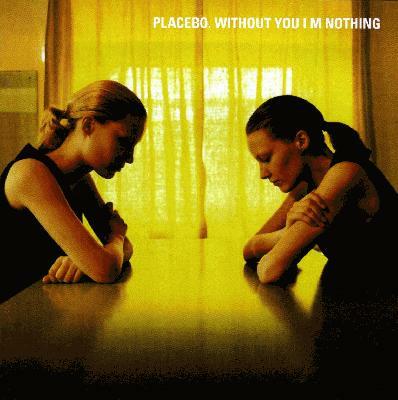 Musically “Without You I’m Nothing” is defiantly not the album for anyone interested in amazing solos or insane fret board work instead Placebo stick to what they know best, harmony among instruments and excellent rhythms. The opener “Pure Morning” displays a terrific rhythm which is driven by thumping drums and simple electric guitar although it may be labeled by some as repetitive “Pure Morning” displays the true capability of the band and is one of the better tracks. Throughout the album many of the tracks consist of a simple guitar, bass and drum layout. The band do try some different set ups on other tracks such as “Burger Queen” which consists of no bass and some electronic influence, this experimentation does pay off making it one of my personal highlights. Molko’s guitar work is slightly conservative on this release which does disappoint but “Without You I’m Nothing” does display how well he can create a mood in a song. The dark and haunting feeling of the song is topped with some well placed guitar work, the song gives a similar uneasy feeling to “Bruise Pristine” on their self titled release. Although on some tracks the instrumental work is wisely used there are some songs where the instrumental work is poor. “My Sweet Prince” and “Ask For Answers” lack any creativity or thought in the instrumental work, they have barely any layers at all and overly repetitive, sadly tracks I tend to skip. On the album the instruments find their place among each other which creates cohesion and lays the platform for some excellent rhythms and some electronically influenced songs. The vocals and lyrics of the album are done quite well. Firstly the vocals of Brian Molko are either loved or hated by people but I find on this album he does some different vocal work and can create emotions very well with his voice. “Scared of Girls” displays his skill to do this. It is a very loud and powerful song and Molko helps establish an almost desperate feeling. The experimentation continues in the vocal section with “Brick S***house” where Molko uses effects on his voice throughout the song to make it part spoken work and singing which pays off quite well in the song. The lyrics of the album are really some of the bands best. I could go through and list some from each song but I would like to draw attention to only a few. “Every You Every Me” is my favorite song from the album but I feel the lyrics are the real highlight. “Allergic” is a track that the band exhibits much deeper and darker lyrics, these lyrics do work well in the song and make it one of the albums better tracks. Although musically and vocally the band does deliver, there are some tracks that are much below Placebo’s usual standard. The poorer tracks on the album are slower and contain little instrumental and lyrical work. “Ask For Answers”, “My Sweet Prince” and “The Crawl” are some of my least favorite tracks but are still decent songs though. The more rock influenced songs on the album are all very high quality “Brick S***house”, “Scared of Girls” and “Allergic” are all examples of the rockier songs, although these tracks don’t contain many great instrumental pieces or lyrics their simplicity and ideas used by the band make them some of the better tracks on the album. “Burger Queen” and “Summer’s Gone” are slower electronic influenced songs. Burger Queen is one of the albums highlights, it is a soft, calming track which really makes it a top album finisher. “Summer’s Gone” is a great track that has a very regrettable tone. The singles off the album are my personal highlights though. “Pure Morning” and “Every You, Every Me” are both lyrically outstanding and all instruments work very well in the tracks. “You Don’t Care About Us” is a bouncy, more upbeat track that is obviously designed for commercial success. A complete contrast from that track is “Without You I’m Nothing” which is darker and more emotion, Brian Molko and David Bowie’s voices work well together in the track and promote the brooding feeling of the song. Good review, this album's been needing one that wasn't a 5. I agree about The Price, I can't stand it. "A friend in need 's a friend indeed, a friend with weed is better, a friend with breasts and all the rest, a friend who's dressed in leather". I've only gotten around to getting this album so i'm not the one to ask. my favorite track on meds didn't even technically exist on that album (running up that hill). I wouldn't say this album is a classic, but it really does have some awesome songs on it. Without You I'm Nothing is an excellent song. HOW can you skip "My Sweet Prince" and "Ask For Answers"? They're one of Placebo's best songs. At first I didn't like them, because I wanted to listen to stuff like "Bitter End"... But then I found out their true beauty. I love how moody and sad they are.